Chess has its origins in the Arabian game of Shatranj, which goes back to the Indian game of Chaturanga. It is also related to Xiangqi in China, to Janggi in Korea, and to Shogi in Japan. Many other games have been inspired by or based on Chess and its relatives. All of these games are similar to Chess yet also different from it in various ways. 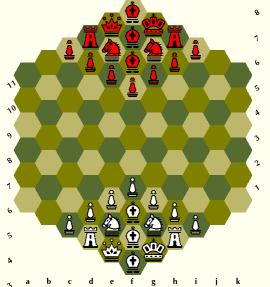 Thanks to computers and the internet, it is now possible to play several of these Chess variants without physical boards and pieces. This website – The Chess Variant Pages – is here for cataloging, discussing, and playing the many games that are based on, related to, or similar enough to Chess. Why Should I Play Them? Where Can I Find Equipment or Opponents? How Can I Design and Post my Own? Who are Behind the Chess Variant Pages?